How do you create an engaging online training? Use video to illustrate the need for the training. For instance, if you train paramedics in dealing with aggression (and unfortunately, yes, paramedics do face aggression), you might start your online training with a video taken from a news item on this topic. This is not so different from a regular “live” training session: The video provides an illustration of the problem and then you step in to learn participants how to deal with a situation that they may face themselves. In an online training, you can also set up a discussion based on the video. In all Learning Management Systems (LMS) I know, you can include a forum in a training. Just make it clear in the title and the description of the forum what the purpose is. If you have a small number of participants (or if you divide them into small groups), you can task everybody with posting a statement based on what they’ve picked up from the video. Bob cites an intrinsic advantage of computer based training: you can repeat as much as you like. This is the hard part: Where do you find videos which are relevant for your training? Apart from shooting them yourself, there’s nothing for it but to look them up on Google. As an example, suppose you are training a group of managers how to motivate highly educated professionals. So, you are looking for a video, say on YouTube or Vimeo, which explains what really motivates people. In other words: apply your Google search skills to find relevant videos. You might come up with The surprising truth about what motivates us. Once you have found a suitable video, you have to put it in your online training. Now, how this is done exactly depends on your LMS of choice, but it is usually not very complicated. 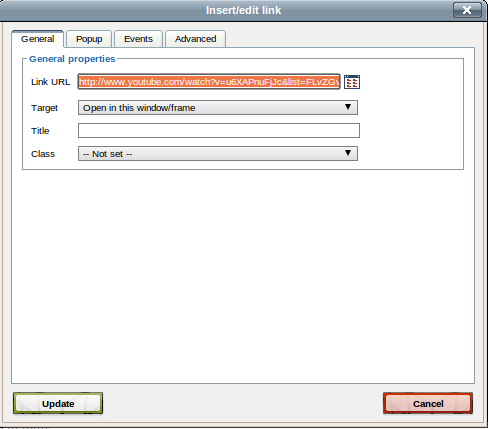 First, you add a new resource to your course (in Moodle, a training is called a course, which is divided into topics). 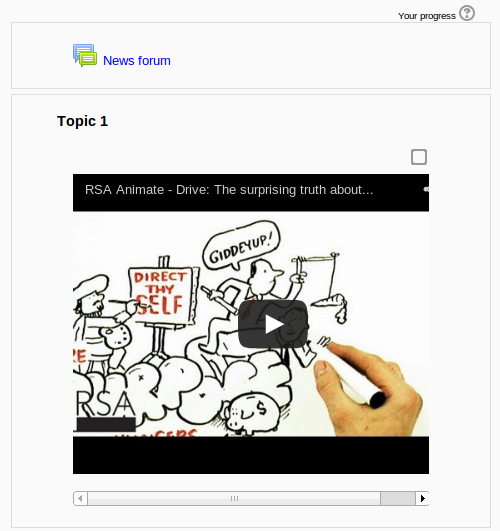 Then you select the resource “Label”, which you can use to embed videos. Type in the title of the video, select the text and click the “Insert/edit link” button. In the little “Insert/edit link” window that pops up, simply input the url (the web address of the YouTube movie that you can copy from the address bar of your browser if you’re looking at the movie). Still inside the popup window, click on the “insert” button. If the popup window has disappeared, the video title should now be underlined. Click the “Save and return to course” button (you may have to scroll down a bit to see it). That’s it! You have added a video to your online training. Unfortunately, there is no way to get notified if a YouTube video is no longer “in the air”. In other words: if you embed a video, you have to check your online training regularly to see if the video can still be viewed. The video’s owners, or YouTube, may have taken the video down for whatever reason. So, watch out for broken links. To summarize: you can use freely available videos, found through Google, to spice up your online trainings. Your trainees may revisit conceptually difficult videos until they “get it”. Use an LMS (Learning Management System) to embed videos in your online training quickly and easily. P.S. : You can also upload your own video to Youtube and then embed it in a course. Because Youtube has powerful servers, distributed over the whole world, with very high capacity connections to the internet, this is the fastest way to ‘serve’ videos. Once you have uploaded your video to Youtuby, make sure to select the right ‘thumbnail’ (mini picture) for your video. I ended up looking very goofy because Youtube had selected a random shot from the video. If you need to host the video on the server of the LMS (in our example, Moodle), then you should use the .webm (HTML 5) video format. This is the most widely supported format nowadays.